The “mental illness” industry propaganda machine is running full throttle this month, especially in my neck of the swamp. All sorts of events have been planned, here in Gainesville Florida, for May, Mental Health Awareness Month, a 60 something designation originated by Mental Health America, at one point almost the lone voice for the mental health movement, a movement to get government to foot the bill for “mental illness”. A local movie theater is showing Call Me Crazy, one of Hollywood’s most recent excursions into the area of “mental illness” propagandizing. There is also going to be a panel discussion, and a Mental Health Fair (sic), Apparently, given “campaigns against stigma”, there is no way in hell that “mental illness” can be allowed to keep a low profile. This is about selling nonsense, folks, and as it is being done all over the country, it is about selling nonsense big time. Did I say big? “Mental illness” is big business. This is how it works. You’ve got a tin cup pitch being offered in unison for more funds to pay for it. It is psychiatric labeling, drugs, “mental health” workers and facilities. Education is particularly important. Education is corporate propaganda, in other words, advertising. The more educating you do, the more “mental illness” you get. The more “mental illness” you get, the better your chances of swindling the public into giving you more money. Prevention is a joke at this point. Prevention is usually a matter of labeling and drugging children. Not getting ‘em early on is seen as “causative” because it is thought that delayed diagnosis increases severity. Problem. The kid who is not got is not “ill”. The severity of the label starts with the label itself. Not that long ago, in fact, childhood wasn’t a bona fide “mental illness”. Actual people, baby sitters and parents, tended the fledgling flock of humanity,. Now, more and more often, the child rearing task is being relegated to stimulants, sedatives, and happy pills, and I can’t say that they’ve been doing a terrific job of it. We’ve got a “mental illness” epidemic raging throughout much of the world today, and no wonder. If gun violence erupts, “mental illness” did it. If people are poor and without permanent shelter, they must be “mentally ill”. “Mental illness” is our answer to social issues. It’s not a matter of flawed groups, it is a matter of flawed individuals. All we need to do is segregate, label, drug, and treat the offending parties responsible for any disagreement in groups, and voila, everything is hunky dory again. Not so fast. The perfect son or daughter, who received the perfect grade, got the perfect job, and now runs the perfect major corporation are becoming more of a liability than our “diseased” failures ever were. Life on the planet earth is now threatened by our idea of wellness and success. Maybe we need to take a harder look at the potential in our throwaway populations of people. Perhaps there is something we missed, Perhaps they are not so totally tainted and ruined by “brain disease” after all. You will never find a “mental illness” under a microscope lens. This is because “mental illness” is not a legitimate medical condition. There is nothing to find when what passes for symptoms are merely a checklist of aberrant behaviors. Although some psychiatrists would resolve the Cartesian mind body duality by declaring mind brain, I challenge anybody to find an identifiable thought or feeling in a synaptic cleft or a neural circuit. It will always elude them. Mental and physical are simply not synonymous. The dilemma confronting us today is that standard psychiatric practice invariably involves physically damaging the patient. The propaganda is not propaganda favoring “mental health”. What is that? The propaganda is actually propaganda favoring physical injury. The way out of the psych-ward should not be through another department in the hospital, or the mortuary, but this is increasingly becoming the case. The only ‘other way’ involves seriously butting heads with the mental health establishment as “stigma” has been redefined to mean any disagreement with the propaganda. Mental health movement propaganda has reached a nauseatingly feverish pitch of late. Mental health and “mental illness” months, May and October respectably, have become times to blitzkrieg the American public with pathetic personal stories that embellish appeals for money and legislative action. The legislative action is generally aimed at treating people who don’t want to be treated, not wanting to be treated being perceived as an indication of a more severe “illness”. The problem with this frenzied state of affairs is that it means increasing the numbers of people in treatment and, additionally, it means multiplying the numbers of negative outcomes. Certainly throwing money at any problem is not going to make it go away, quite the reverse, and such is the situation with the mental health treatment world. When you consider that safe and effective treatments are the exception rather than the rule, you’ve also got to consider the fact that we are throwing good money after bad. Mental health is not, at the present time, to be found in mental health treatment. Nor is physical health. Compliance is a matter of buying the lie that will eventually kill you. Don’t be fooled by the propaganda. 1 in 4 people are not “sick”. The idea is not only patently absurd, it’s offensive. The number one notion that the mental health movement is promoting and selling is the notion that “mental illness” exists, that it is real, and that it is physical. Apparently, a good dictionary to settle the matter is too costly of an investment to be made. Who needs a dictionary anyway when you’ve got the unmitigated gall to redefine everything to suit your propaganda purposes. The gap between minor and major “mental illness” is as small, or as great, as you want to make it. People, given the most severe diagnostic labels, have been known to recover, and escape from the treatment gulag. How do they manage this seemingly incredible feat? In the same fashion that people with more minor “mental illness” labels escape the mental health system. The mental health treatment system is a dependency system, and those that make their way into more healthy lifestyles, do so by becoming independent of that system. Prognosis, as fate, doesn’t offer many options. It’s like playing against loaded dice. Your chances of winning are zilch. There are, therefore, better career choices than that of statistical dead weight. The question is how long is it going to take before the good intentioned mental health movement stops selling and promoting “mental illness”? This “mental illness” is actually the apotheosis of the negative prognosis. It has an existence, surely, but only in so far as we believe in it, and only in so far as we invest in it. Think elves and unicorns. As long as there is an ear for it, there will be a market for the good bedtime story. Faulty logic can be engaged in, coming up with erroneous conclusions, without correction infinitely. Folly of itself doesn’t necessarily lead to wisdom. Circular reasoning has it’s circuitous course evading any potential resolution. “Mental illness” as an enterprise has it’s obvious shortcomings and limitations. One of these limitations is definitional. The mental health movement is captivated with an illusion. “Mental illness” is the illusion that the mental health movement is captivated with. It cannot move beyond this illusion without moving beyond itself, and its aims and illusions. Realism is devoid of illusion by definition. The false us and them dichotomy has fallen by the wayside. We are no longer in a realm of the healthy and fully human versus the sickly and inferior subhuman. Such unproven leaps of judgment are not permitted. Triumph by the elimination of chance is not an option. We’ve dispensed with the loaded dice. The door is not locked, and the patient is free to come and go at will. Your true adult has always had more options than your fake adult child. Success, for the suffering, once again becomes a possibility. Given the right circumstances, it becomes a certainty. 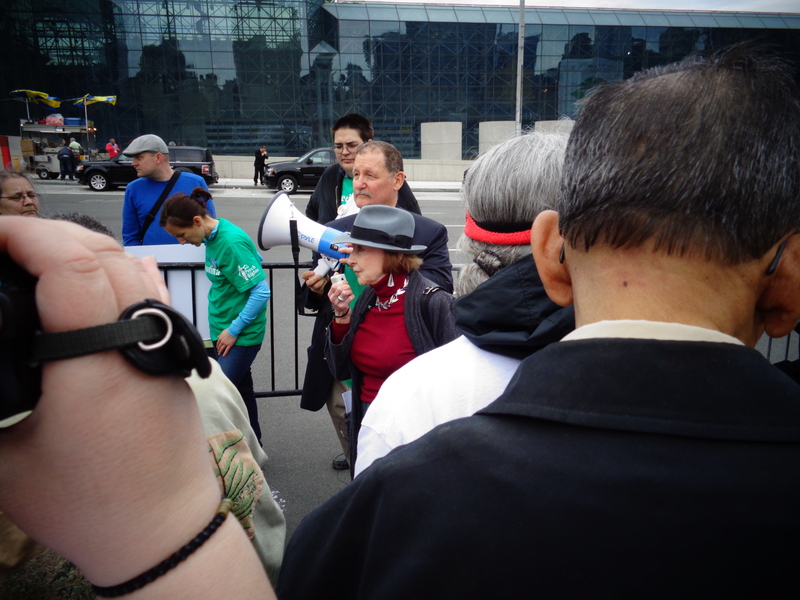 Lester Cook, with bullhorn, and Celia Brown, director of MindFreedom International, in front of the Jacob K. Jarvits Convention Center in New York City. 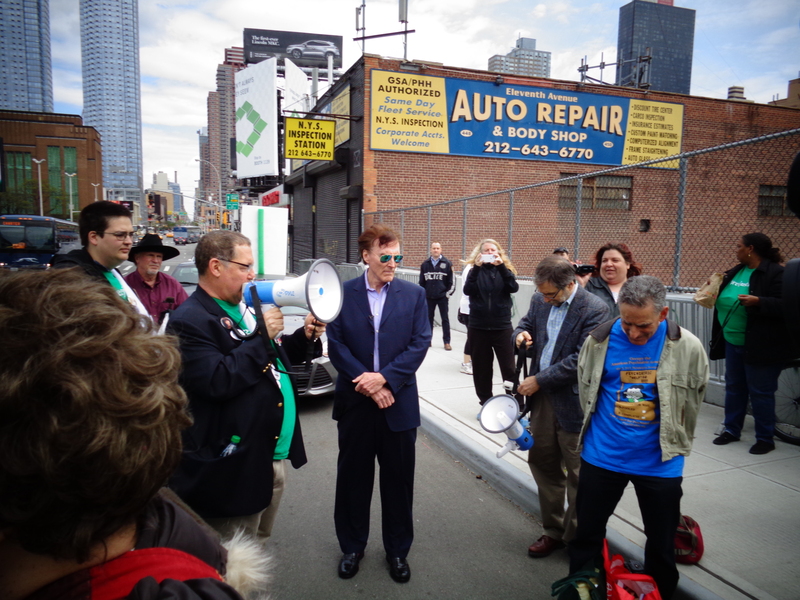 Jim Gottstein, director of the Center for Psychiatric Rights, Gary Null, author and radio show host, and Harry Bentivegna Lichtenstein at the demonstration. Vera H. Sherav, founder and president of the Alliance for Human Research Protection, speaks at the protest. 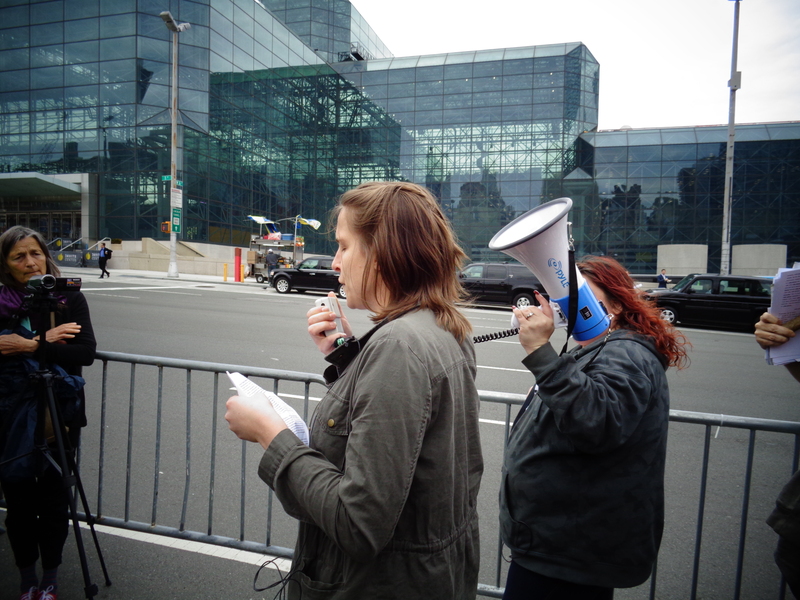 Laura Delano, psychiatric survivor and Mad In America blogger, speaks at the protest. The theme of the annual meeting of the American Psychiatric Association this year is Changing the Practice and Perception of Psychiatry. In other words, whitewash, and therefore, actor Alan Alda, former Senator Patrick Kennedy, Vice President Joseph Biden, and actor Joey “Pants” Pantoliano are present at the event. This is PR, baby, and in a big way, too. The drug companies are also well represented. There is, in fact, a Disclosure Index in the downloadable program that shows the financial relationships between the speakers and Big Pharma. Most of the speakers have such ties. 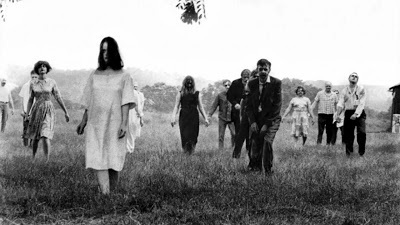 As for Change in Practice, the APA began in Philadelphia in 1844 as the Association of Medical Superintendents of American Institutions for the Insane, there were 13 members back then. Fast forward, there are 36,000 some members now. I was reading just the other day how someone didn’t think there were enough pediatric psychiatrists in the USA. The slant of this article then was that we need more child psychiatrists labeling and drugging more children, a situation sure to result in more maimed, wounded, and in some cases, dead children. The fact that Vice President Joe Biden has been invited to give a lecture tomorrow should come as a surprise to no one. One of President Barrack Obama’s most insistent reelection campaign promises involved criminalizing mental patients. Why else would their names be put on a criminal background checklist while their second amendment constitutional rights were routinely violated? Vice President Biden was chosen to chair a task force making scapegoats of people in the mental health system for the violence of a very few individuals. Out of this task force, and other committee meetings, it has been proposed that school workers be trained as mental health cops. These mental health cops would target children for labeling and drugging, and they would bust them for “mental illness”. The idea is that if we catch them early enough, they won’t slip through the cracks in the system, and grow up to become multiple murderers. I have more of a worry, on the other hand, that they may be murdered instead, and by psychiatry. I think we must be in the second century of the brain now, researchers are so intent on finding a biological basis for so called “mental illness”. They’ve got it all figured out. “Mental illness” is physical illness, black is white, war is peace, hate is love, and death is life. If there’s a third century of the brain, I’d wager they won’t find any biological basis for so called “mental illness” then either. What we will get out of the matter is more dead babies, more dead adults, and more dead senior citizens. One cannot fail to see irony in the fact that the same government that would contain its mental patients through violence, attributes violence to mental patients. Labeling a person “mentally ill” sanctions libel, abduction, assault, torture, imprisonment, neglect, brainwashing, poisoning and even murder of that person, all in the name of mental health. Psychiatry is voodoo science. In that profession, you’ve got phony doctors, using phony medicine (real poison), on phony patients, to treat phony diseases, with devastating results. On May 3 through 7, 2014, the American Psychiatric Association will be holding its annual meeting in New York City. The theme of this years meeting is Changing the Practice and Perception of Psychiatry. This event is not likely to touch upon the issue of human rights violations by that profession as it’s primarily a public relations scheme and a defensive evasion of responsibility. Among the distinguished guests assisting the top dogs in the field of psychiatry in pulling off this professional whitewash extravaganza are Vice President Joe Biden, actor Alan Alda, and actor Joey “Pants” Pantoliano. At present the rights and freedoms of citizens are being threatened on several fronts by this same profession that would be talking change. It is common knowledge among many people who deal with the mental health system on a daily basis that things within that system are getting worse, not better. There is repressive legislation being pushed by special interests groups, especially in the instance of H. R. 3717, a bill, deceptively called “the helping families in mental health crisis act”. H. R. 3717 would essentially deprive patients of a great deal of the hard won legal rights and protections that they had achieved over the years if it were passed into law. There is also the issue of forced treatment, made most acutely apparent with the recent abduction of Justina Pelletier by the state of Massachusetts. 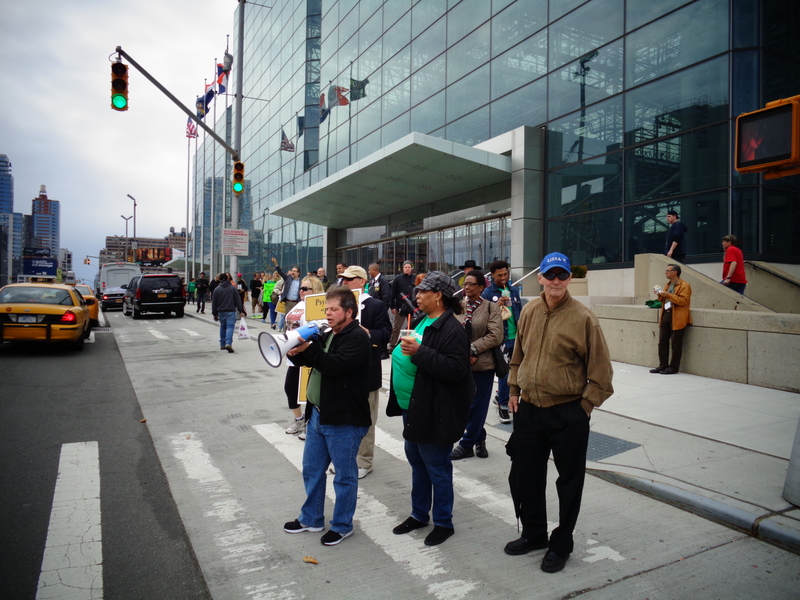 On May 4th there will be a protest of the APA across the street from the Jacob Javitz Convention Center where the APA annual meeting is being held. This protest, themed Stop Psychiatric Assault, and orchestrated by psychiatric survivors, their friends, and allies is co-sponsored by the human rights organizations MindFreedom International and the Law Project for Psychiatric Rights. To my way thinking, this protest is much more important than the whitewashing ceremony the APA will be conducting. It is so important, in fact, that I am making the trip all the way from Florida to NYC to participate in this action. Organized psychiatric crime may have a few Hollywood celebrities and politicians fooled, but the rest of us are more astute than that bunch of bozos about the situation. Oppressive maltreatment and abuse masquerading as “help” are commonplace in the mental health system. Psychiatry kills more often than it “helps”. As this is the case, any and all action that can be taken against the abuses conducted in the name of this profession are called for. Only by protesting oppression, and by educating the public, can we bring attention to the severity of the problem we face, and by bringing attention to it, change it. I hope you will, if possible, join us on May 4th, 2014 in our protest across from the annual meeting of the APA. We need all the people we can get in this, our struggle, against forced treatment and for human rights. Freedom used to mean something in this country, and it still means something to those of us who have experienced its eclipse. People are being deprived of freedom, insidiously crushed, and slowly poisoned to death by psychiatry at this very moment. You can do your part to end this death and destruction by joining us on May 4th across from the Jacob Javitz Convention Center in New York City when we strike a blow for life and freedom. 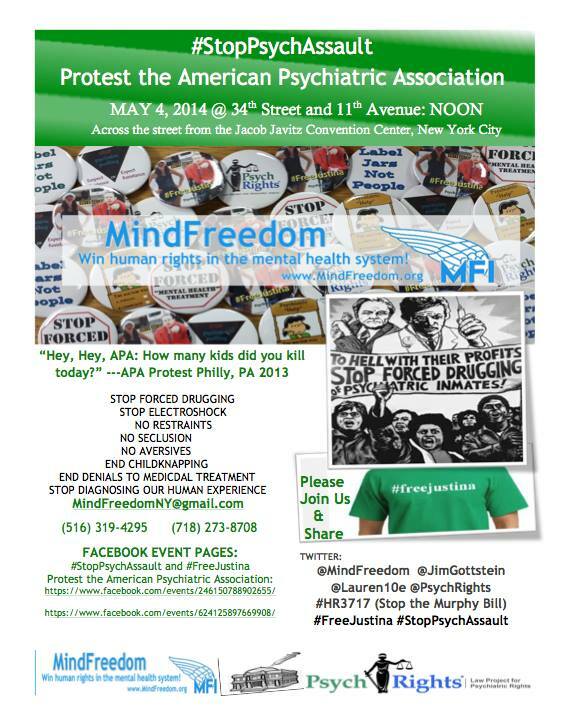 Join MindFreedom, Protest Psychiatric Brutality! Question: What do psychiatry and voodoo have in common? One of the biggest clown doctors going at the present moment has got to be Ronald Pies. It would be remiss of me to claim that in his latest post, Nuances, Narratives, and the ‘Chemical Imbalance’ Debate in Psychiatry, he has outdone himself. If there was anyone destined for a pie in the face that anyone has got to be Ronald Pies. I would be honored, in fact, to bestow upon Dr. Pies the moniker Ronald “Pie In The Face” Pies for all posterity. Ronald Pies is a marvel of nonsensical shrink think. In his latest escapade into the theory and practice of shrinkery, Pies, by some disingenuous twist of convoluted illogic, would blame “the chemical imbalance theory” on that bug-a-boo and will-o-the-wisp of modern psychiatry, antipsychiatry. Go figure. Now, if you were to give credence to a recent online polemic posing as investigative journalism, you would probably choose the first or second statement. In the narrative of the antipsychiatry movement, a monolithic entity called “Psychiatry” has deliberately misled the public as to the causes of mental illness, by failing to debunk the chemical imbalance hypothesis. Indeed, this narrative insists that, by promoting this little white lie, psychiatry betrayed the public trust and made it seem as if psychiatrists had magic bullets for psychiatric disorders. (Lurking in the back-story, of course, is Big Pharma, said to be in cahoots with Psychiatry so as to sell more drugs). Those first two statements Pies alludes to here would be those that indicate either “mental illnesses” were caused by “chemical imbalances” in the brain, or merely that more “serious mental illnesses” were caused by “chemical imbalances” in the brain. What we don’t get out of this story is precisely who was responsible for promoting and spreading this “chemical imbalance theory” that these people in some antipsychiatry movement would be exposing. Where is psychiatry here? Defending itself from those who would be exposing a discredited theory. Certainly it is not defending itself from the ones who would be promulgating that theory. Curious indeed. Among his more bizarre notions is the notion that this “chemical imbalance” theory has more to do with some catecholamine hypothesis from many years back than it does with the development, marketing and advertising of those trendy psychiatric drugs still surging strong on the market of today. To the extent the “chemical imbalance” notion took hold in our popular culture, it was due mainly to distorted or oversimplified versions of the catecholamine hypothesis. These were often depicted in drug company ads; pop psychology magazines; and, in recent years, on misinformed Websites and blogs. In short, the “chemical imbalance theory” was never a real theory, nor was it widely propounded by responsible practitioners in the field of psychiatry. Does Dr. Pies mean that psychiatrists don’t use, or shouldn’t use, those drugs that would be advertised as purporting to correct some kind of postulated and theoretical “chemical imbalance”? I think not. This leads to another question. To what extent has psychiatry, or the majority of its practitioners, colluded with pharmaceutical companies in producing an atmosphere that now has commercial interests in the media peddling pills, not just to medical professionals, but to the entire buying public perceived and re-envisioned as consumers who will purchase anything at the provocation of the most mesmerizing sound bite? In the latex gloved mitts of Dr. Pies, our babble here has degenerated into very nuanced babble indeed. If you will notice, despite the nip at bio babble unrefined, bio still has top billing in the theoretical credits. I don’t think this is entirely because of the order of words in the alphabet, or accidental. The mad doctor has shown himself sufficiently proficient in blurring the lines between disciplines to earn himself a rank of major distinction in the therapeutic circus. If criticism equals antipsychiatry, well, there you go. The message is coming in loud and clear. Don’t criticize psychiatry or you must be promoting the discredited “chemical imbalance theory”, too. Clown psychiatry rules! Much bad ink has been spilled over calling the nation’s jails and prisons mental health facilities because of the number of people within their walls who have also been given psychiatric labels. The latest report along these lines claims there are something like 10xs more mental patients who reside in criminal justice facilities than in state hospitals. These numbers come from a study conducted by the Treatment Advocacy Center, the USA’s number one lobbyist for more forced psychiatric drugging, and the National Sheriffs Association. The culprit in this debacle is said to be deinstitutionalization. Let me start off by saying people don’t go to jails and prisons because they are sick and because they wish to receive medical attention. People are sent to jails and prisons by the courts to receive punishments because they broke the law of the land. Second, state hospitals have traditionally been psychiatric jails and prisons. Merely trading this kind of prison for the other kind of prison doesn’t make a hospital in actual fact. I would say that, given the prison overcrowding problem that comes of three strikes laws, America has grown increasingly intolerant of difference, and law crazy itself. If your way of dealing with bizarre behavior is to outlaw it, your jails and prisons are going to fill with people behaving bizarrely. Bizarre behavior may be a crime, but it is only a disease by a wild stretch of the overactive imagination. Statistics tell us their own story. For statistics, before we look at those coming from the recent study, let me refer to the Preface of the 2006 book crazy authored by journalist Pete Earley. Earley is another apostle of this blame deinstitutionalization religion. According to Earley, in 1955, there were 560,000 people in state mental hospitals. He speculates not about the numbers of people who might have been referred to as “mentally ill” in prison or jail at that time. Between 1955 and the year 2000, the population jumped from 166 million people to 276 million people. Given this population increase, and no change, the numbers of people in state mental hospitals would have been something like 930,000. Earley gives the present number of people, from maybe a 2002 or thereabouts survey, with “mental illnesses” in jails and prisons at 300,000. He gives the present number in state mental hospitals at 55,000. Hmmm. Something peculiar is going on here. 500,000 people are unaccounted for. These are the people who, with the population increase figured in, would be in the state mental hospital system if we were still doing business the way we had in 1955. 500,000 people is more than half the number of people we are dealing with in the stats for a later year. You add 55,000 to 300,000 and you are still lacking 205,000 people from the 1955 figure. This is not the kind of figure that supports the contention that deinstitutionalization was a mistake, or that it was a disastrous failure. Instead it would seem to indicate that more and more people described as “mentally ill”, if not fully recovering, are being better integrated into the communities from which they came. This is a coup for least restrictive care, and least restrictive care is something that nobody receives as a prisoner on the locked ward of a state mental hospital. According to the TAC and NSA research, there are 35,000 people in state hospitals, a 2012 stat, and 356,000 in jails and prison. Wow. We’ve got 20,000 fewer people, referencing the Earley stats, in state mental hospitals than we had 10 or so years earlier! If we’ve got more in jails and prison, too, part of that increase can be explained by population increase. What Earley gave us was something of an estimation based on statistics anyway, but we’re still minus a great number of people who would be “hospitalized” in the year 1955. All in all, I’d call deinstitutionalization a major success story. We’ve still got a lot of people in jails and prisons, given stiffer sentences and overcrowding, who don’t need to be there. One deinstitutionalization success story doesn’t justify an increased amount of institutionalization for another sort of institution. Blaming violence on “mental illness” is the latest media and political trend. I’d like to remind people that the court of public opinion is not a court of law. We have a supply of the kind of acts, in the present climate, that the media circus demands. Should we look at the number of violent acts committed by people with no experience in the mental health treatment system, I’m sure that those crimes are not decreasing dramatically in number either. Violence is not a symptom of any “mental disorder” in the Diagnostic and Statistical Manual (DSM). When it comes down to it, death is much more likely to be a result of gun fire than it is to be a result of any psychiatric diagnostic label in a mental health professional’s repertoire. I suggest that we will have more success with the problem if we deal with the causes, and I don’t see “illness”, physical nor mental, as one of the primary causes. I would, on the other hand, do something about the climate of suspicion, hatred, and indifference that breeds crime, hardship, and troubles. Here, I think we can actually make a difference if we tried, and that is exactly what we should do.